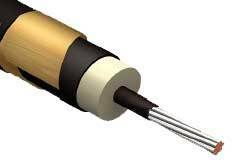 Air Field Lighting Cables are manufactures as per IS:1554 (Part II) and the cable is of 5 KV grade. "Brilltech" is producing the complete range of Airfield Lighting Cables i.e. S/C x 6 Sq.mm & S/C x 16 Sq.mm in Copper and 2C x 25 Sq.mm. Airfield Lighting Cables are with round conductor. These are armored with steel strip and PVC sheathed. The cables are type tested from CRI, DGAQA-Dehradun.